I will admit when I heard of Stars I alway envisioned Google Bookmark being revamped. I pretty much only use my Chrome Bookmarks for my Bookmark Bar, so was surprised that the Stars like functionality came to Chrome Bookmarks. What this means is you will more need to be logged in to Chrome with sync to access all the functionality. Here is what I like. The Bookmarks Bar on Chrome itself stays the same, but when you go into manage you get "pinterest like" experience. When you click the star in the address bar you can select an image for your bookmark. What I was not so impressed by was the auto folders did not seem to be working at all. The whole idea of auto folders was that you did not have to worry about creating folders, Google would. Another thing I did not like was eventhough there was a "share folder" it was not working. I certainly hope sharing will be added in the future. I would love an interface where, like Google Drive, I can privately share folders with other users, publically, or with a link. Maybe publically or with a link can be shared through Google Bookmarks. 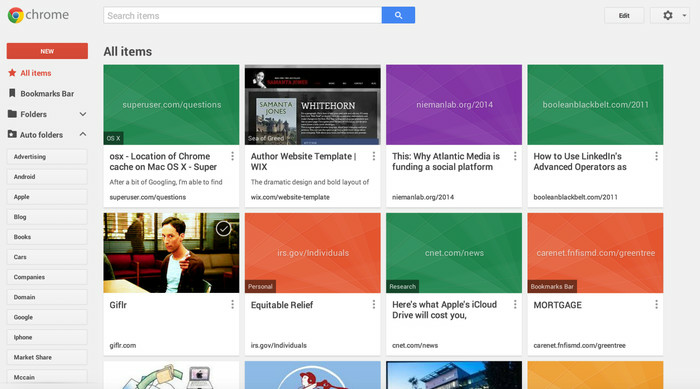 For those of us who like to keep our data within the Google ecosystem this could be a great tool in bookmark sharing. I would love the option of sharing a folder with a specific account - teacher to students for example - or in a GAFE setup limiting the bookmarks to domain.